The tragic truth about our Catholic Church today and far too many of its bishops, priests, religious and lay people is the failure to make the Sacred Eucharist the center of our lives, as our Lord has commanded us to do. In far too many parishes, we have, for all practical purposes, ignored and abandoned our Eucharistic Lord imprisoned in tabernacles behind locked doors. When we are in His Presence we often act irreverently and as if He were not there. Multiple surveys have concluded that few holding themselves out as being Catholics actually believe that our Lord is really and substantially present in the Eucharist. We have lost the sense of the sacred, using our Church buildings not exclusively as places of worship, prayer and adoration but for such inappropriate activities as secular community events, pageants, slide shows of our graduating students, the viewing of secular movies, coffee cafes and socializing. For centuries, our Lord has been calling us “to come to Him in the Sacrament of His love.” His requests have fallen on deaf ears, hard hearts and cold souls. This cannot continue. We have to do something about this disgrace NOW! We must speak candidly about this crisis in our Church to our priests, bishops and to each other – the salvation of souls hinges on our doing so. If you share the concern about the loss of the sacred and belief in the Real Presence, if you can feel our Lord’s pain over being ignored by so many of His creatures, and if you love Him and His priests than you MUST give your pastor (as well as yourself) a copy of the recently published journal of a Benedictine Monk entitled In. 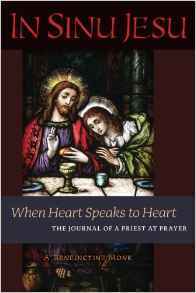 Senu Jesu – When HeartSpeaks to Heart – The Journal of a Priest at Prayer. Father Joachim Schwarzmuller of Krefeld, Germany had this to say about this book: “In Sinu Jesu has the power to inflame the desire for Eucharistic adoration. It is a powerful expression of Our Lord’s thirst to draw us deeper into His friendship, to heal wounds, and thus to renew the Church." No one who is sincerely seeking to make God the center of their lives can prayerfully read this journal and persist in disbelief and irreverence toward His Eucharistic Presence among us. Nor could any such person continue to ignore our Lord’s desire to “share with you the secrets of His Heart”. My Most Holy Eucharist is not only My Sacrifice offered to the Father, although in a bloodless manner; it is not only the sustenance of souls, nourishing them with My very Body and Blood; it is also the Sacrament of My divine friendship, the pledge of My burning desire to remain close to all who seek Me, to all who need Me, to all who would spend time in My company. This is why it so grieves Me that churches are locked and that 'I am left for days on end alone in the tabernacle. I would draw souls to My open Heart, I would have them experience what it is to abide in the radiance of My Eucharistic Face, I would give Myself in intimate friendship to souls drawn to Me in the Sacrament of My love, but you priests, shepherds of souls, have forgotten that keeping open your churches is integral to your sacred ministry. I would pasture souls in My Eucharistic presence, but you, by continuing to close My churches to souls, frustrate and contradict the desires of My Eucharistic Heart. There is sorrow in heaven over this. It is not difficult to keep My churches open and to provide for the spiritual needs of those who would readily enter them in search of My friendship. The obstacles are not those of which you think; the obstacle is a lack of faith, a loss of belief in My real presence. My priests will be held responsible for the coldness and isolation that has come to surround Me in the Sacrament of My love. How I desire to see My churches open! Open the doors of My consecrated houses and trust Me to fill them with adorers in spirit and in truth! We are not accustomed to such frankness. These words may make us uncomfortable. They should.